This is the third of Robinson’s interconnected series which started with the book Gilead, the name of the small Iowa town of the setting. In that first book, John Ames is an aging minister who writes a letter explaining things to his 6-year old son who will basically grow up without his father. In Home Ames’ good friend Reverend Broughton and his family are featured. 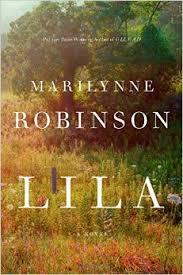 In Lila, we meet the woman who becomes the old Reverend’s wife and bears him the young son of Gilead. This is taking place in 1948 or a bit later* so Lila is age 30-something. She has had quite a life before landing in the little church in Gilead, having been a lost child and a child-migrant field hand prior to the Great Depression/Dust Bowl days to adulthood when she lived for a time in St. Louis. Her life has been one of distrust and keeping quiet. She has never been introduced to church or decent people like those she meets when she wanders into Gilead. These folks challenge her very fundamental beliefs about life, but Lila is a stubborn as well as a very troubled young woman. There is a whole lot she doesn’t understand about religion and the way her own life has been lived out. The minister is at a loss to explain it. This eternal question of “Why do bad things happen to good people?” is probably at the heart of the novel – that and the questions of who all goes to hell? What is baptism and what is redemption? The narrative structure is interesting as the omniscient narrator starts out giving the reader insights into the thoughts of a great number of people, but Lila starts out as and remains the star. She’s baffled mostly, and feels lonely, scared, proud, angry, ashamed, guilty and nervous about happiness. And Robinson’s use of metaphors are delicious, natural, original and appropriate – the book is packed with them from simple individual metaphors to overarching thematic ones. Combined with the rhythmic language it’s almost poetic -) Because of all the thinking Lila does the book can get slow from time to time, and a bit boring. And the story goes from her present circumstances as they progress, to all her memories with a linear story-line in the backstory as well. There’s an incredibly integrated flow to the back and forth, from current situation to memory, often without any announcement – sometimes in the same paragraph. The transitions are so smoothly executed that it feels like the contemporary Lila disappears into them. The symbolism is a wee bit overwrought at times – it seems like I was finding allusions and references and Biblical symbolism throughout. Fairly long passages from the Bible are quoted, incidents and images have Biblical resonances – I’m sure this would be a fascinating book to study. * I figured this out by looking up the movies mentioned – Gilead is a very small town – when she arrives (page 220) the movie “To Have and Have Not” is playing – released in 1944. But in the frame story the movie is “Treasure of the Sierra Madre.” The release date used to be months or years prior to a film showing in a small town, so I’m thinking that this may have been 1950 or so.